This timeless tale of Harry the dog (which was first published back in the early 60s) sees the mischievous pup enjoying a day at the beach with his family. Harry being Harry, it's not long before he gets into trouble and causes uproar. I loved these books as a kid, and it's easy to see why Charlotte also loves them. The bold illustrations bring out Harry's character perfectly, and the story jogs along at a nice pace. It's a bit of a shame that Red Fox only republish 3 of the Harry books (and not the absolutely hilarious "Harry and the lady next door") but hopefully these books will sell in sufficient numbers for Red Fox to secure publishing rights to the rest. Daddy's favourite bit: As before, Harry in the shade that a fat lady made...! Rating: Still 5 out of 5, still awesome. Diamonds aren't a girl's best friend, dogs are! Fran's friend is a lovely little tale about a girl and her dog. Her poor pooch is feeling a little left out, as Fran becomes absorbed in a very important activity. Fran doesn't want to play ball, doesn't want to go for walkies and doesn't even seem to want to take her dog outside at all - but the story wraps up with a lovely little ending that should make pooch owners smile. Short, sweet and nicely illustrated. The Big Bear / Little Bear books are sweet and cute, and in this tale, little bear is a fidgety little bear who doesn't want to go to sleep (I think just about every parent will identify with that particular scenario). ...well you'll find out in the book. Suffice to say that it's a very neat little tale that has exactly the desired effect on your toddlers when read at bed-time (in fact you'll struggle to stay awake too, not because it's boring but because it's so atmospheric and full of fuzzy and deliciously drawn artwork that makes you want to snuggle under the duvet and catch 40 winks). Updating the classic tale of Gulliver's Travels for a younger audience is tricky to say the least, but Geraldine McCaughrean has managed to put the focus on a little girl's relationship with the gentle giant, creating a story that takes all the best elements of the original and updates them quite nicely. Fig discovers the giant while out playing with her dog on the beach, and from then events rapidly take a turn for the worse once her fellow Lilliputians realise what a valuable asset they have in their continuing war with the Brobdinagians. Jonathan Swift's original story is treated with a fair amount of respect, and though it's a trifle 'grown up' for a 3 year old, they'll still enjoy the anticipation of 'what happens next' with every turn of the page. Charlotte's best bit: The contents of the giant's pockets. Absurd nonsense books are particular favourites at Maybe Towers - the crazier the better, and with a notion like lions living in the middle of ponds on lily pads, Melanie Walsh's toddler-friendly book is a fun read. Entertaining stuff though Charlotte was a bit baffled that the lion in the title isn't actually in the book after all! Miss Fox, a charming supply teacher at a village school, couldn't POSSIBLY be anything but a sweet and delightful teacher - or could she? This jolly tale of a teacher with a rather nefarious agenda, and her pupils including a rebellious young lamb, is excellent reading. Throughout the story, you're never quite sure if Miss Fox is all she pretends to be and though you can pretty much guess what happens when a fox is put in charge of a bunch of tender, delightful, cake-fed little animals, there's still plenty in this book to get your foxy fangs into. After a hectic couple of weeks where Creepy Crawlies (at the White Horse Leisure Centre - £3.25 for a few hours of completely manic play for toddlers - thoroughly recommended!) has replaced our usual library trip we're back on schedule. Catching up with the reviews, Stone Soup has proved to be something of a winner with Charlotte. It's a traditional old fable, beautifully reworked by Jess Stockham with cute and funny animal character illustrations lovingly drawn and painted. Stone Soup tells the tale of a wandering band of tinkers and their rather neat way of scoring a free supper at the expense of villagers they drop in on. Initially cynical and unfriendly, the villagers soon rally round when the tinkers introduce a mysterious soup stone that can provide the most amazing tasting soup. Those familiar with the original fable will know what happens next. For the rest of you, I'd definitely suggest picking this book up. There are lots of flip-up pages for toddlers to explore so it should prove as popular as the soup in the story does. 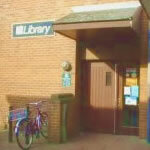 Abingdon Library goes self-service, and how! After a couple of weeks absence from visiting Abingdon Library, Charlotte and I were amazed to find the whole place completely changed the last time we visited. Abingdon Library has now gone 'Self Service" for loans and book returns and the setup is most impressive, particularly for youngsters who get their own fantastic machine to handle the processes previously undertaken by the excellent staff (rest assured though, hopefully this doesn't mean the lovely people there will be disappearing any time soon). For children's book returns, a touch-screen display (complete with Rainforest or Underwater themes) allows parents (or button-pressing busy girls like Charlotte) to stack their books on the reader plate. A few simple on-screen prompts take you through the entire process. All books are automatically scanned back in (that bit was fantastic and most impressive!) and then books are stacked to the left of the display, ready for dropping back onto shelves. Checking books back out again does the whole thing in reverse. Your library card / barcode is scanned by a laser scanner first, then you stack your books up as before, the system reads all the chips inside, and they're booked out against your card. A printed receipt is issued as a reminder for when they need to be back. Daddy's favourite bit - The fantastic auto-scanning-book-stack thing. Rating - A unanimous 50 billion out of 5. Charlotte and I absolutely loved this book! Cowboy Baby is the rootingest, tootingest goldarn little baby varmint the world has ever seen. When Sheriff Pa suggests that it's sleep time for Cowboy Baby, the stetson-wearing scamp toddles off on a quest to round up his gang. Texas Ted, Denver Dawg and the others must all be found before Cowboy Baby can rest his little head and head off to prairie slumbertime. For a toddler who definitely prefers Woody to Buzz Lightyear, Cowboy Baby is an excellent read. Sue Heap's simple and clear illustrations complement the text (which demands you read in a texan cowboy drawl). If your little mite likes cowboys they're going to love this. Revisiting "That Rabbit Belongs to Emily Brown"
Though we first reviewed "That Rabbit Belongs to Emily Brown" last October, Charlotte grabbed it again from the library and I thought it was worth taking another look at it simply because she's been driving us absolutely crazy with this book, wanting to read it at least 3 times a day or more. So what's so fascinating about the story of Emily Brown and her rabbit, Stanley? Getting into the mindset of a three year old isn't easy when they've got 40 years on you but it seems to be the book's neat way of showing the consequences of naughtiness. As we said in the last review, Queen Gloriana the Third will pretty much stop at nothing to own Emily Brown's "bunny wunny" Stanley. No amount of bribery or bargaining will get Emily Brown to give up her companion, her co-adventurer and her favourite toy. Perhaps the veiled lesson "you can't always get what you want so make do with what you've got" may be lost on Charlotte, but certainly Emily Brown's (rather kind) way of helping Queen Gloriana realise this is quite a neat twist. I promise I won't make a habit of re-hashing reviews but the tenacity Charlotte has shown in demanding this book be read make me think it was worth another look. Charlotte's (new) best bit: The dolls that say "Mama, Mama!" Daddy's (new) best bit: Nah I still like the Queen's Secret Commandos. Regular readers of this blog might remember our review of "Mouse, Look Out!" by Judy Waite and Gavin Rowe. A dark tale that seemed slightly menacing for younger readers, but with a fairly happy ending that lifted it somewhat. The Stray Kitten is a very similar tale, this time detailing the young life of a lost moggy as it learns to live out in the wild where every day is a fight for survival, and a learning process. The lovable kitten is cautious, wise but sadly always hungry. Mid-way through this book, the story takes quite a dark twist (as did "Mouse, Look out!"). Probably not suitable for the very young but certainly eminently suitable for children who have inquiring minds and like to read about characters and situations that are anything but fluffy and fancy-free. Charlotte's best bit: The kitten vs the bulldozer "is scary!" Daddy's favourite bit: Wondering what happened to the world mid-way through the book. 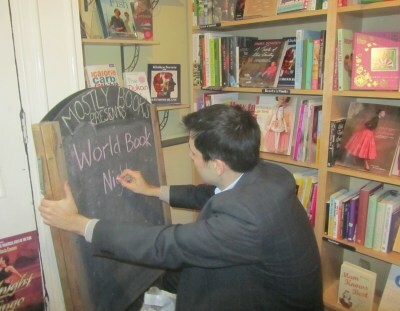 The fantastic Abingdon Blog recently covered Mostly Books and World Book day. Mostly Books is an important independent Abingdon bookshop, one of two in the town (the other being The Abingdon Bookstore). Both shops stock a varied selection of adult and children's books that fall outside the normal chain-store 'big publisher' stock. The coverage also included a link back to this humble blog so many thanks to the Abingdon Blog for the coverage, and a warm welcome to all new visitors finding their way here. As a catch-up, ReadItDaddy is a children's book blog with a view to covering a varied selection of books every week, most of which are borrowed from the excellent Abingdon Library - which has a brilliant children's section. Comments and feedback are most welcome as are new followers! Most children love playing with Play Doh or Plasticine, but what about dough? A child's flights of fantasy are triggered when his mum gives him a lump of chapati dough while cooking. The little boy busies himself making all sorts of animals and characters, until they get the better of him! Silly old forgetful Mog is one of the most endearing cat characters in books. Judith Kerr's feline fusspot is the perfect subject for a rather innovative and whimsical look at ABCs. Each page of the story is peppered with words beginning with each letter of the alphabet (though Kerr uses a bit of poetic license with some of the trickier letters, naturally). Rhythmic storytelling is coupled with illustrations of Mog's rather strange dreams. Do cats dream of more than just chasing mice? Find out in the book! Uh oh, there may be trouble ahead. Charlotte seems to have completely fallen in love with "Mr Bloom's Nursery", a new Cbeebies programme. When asked the other day whether she liked Mr Bloom or Mr Tumble best, she answered "Mr Bloom". Never thought I'd see the day. Although this is a book blog it's nigh on impossible to ignore the influence certain television programmes have on our youngsters. Even the most holier-than-thou parent on the planet would probaby admit to sneaking the kids off to watch TV while they get on with any number of tasks that present themselves during a busy day. So Mr Bloom - new hero for a generation of toddlers who aren't content to put up with the normal toy-selling licensed programmes from across the pond. Home grown children's television (certainly on CBeebies) has never been better. 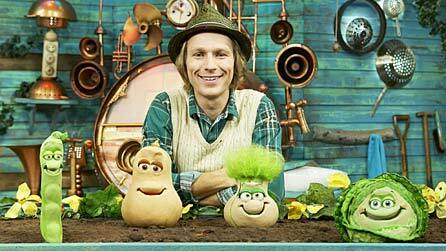 With its roots (pardon the pun) in a touring stage show, Mr Bloom's Nursery is the first major project from the BBC's new Salford-based studios. Handy for Mr Bloom's star, Ben Faulks who lives a few minutes down the road from the specially constructed allotment used in the programme. Local children are brought in to assist Mr Bloom with his gardening duties, and it's the instant identification with the children in the programme, coupled with the (extremely) catchy music and vegetable characters that make it such a hit with youngsters. Amongst the presents for my recent 43rd birthday (maaaan I'm getting old!) was this book. The perfect snuggle-up book to read to a lovely daughter, I Love You Daddy tells the tale of a little toddler bear's first foray into the big wide world, ably assisted by his loving daddy. Little bear learns how to climb trees, how to bother bees and lots of other things in between. Kristina Stephenson's lovely cuddly illustrations are excellent. There are a ton of very similar books on the market but this one (from Marks and Spencer) is very charming and touching. Charlotte's best bit: Toddler bear and the bees. Daddy's favourite bit: Daddy tickles!